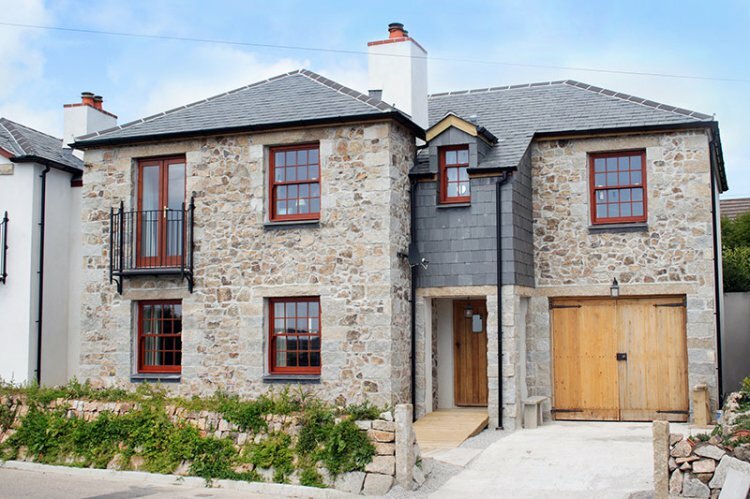 Tresweeta at Kennack, Cornwall is a beautifully designed property just 3/4 mile from the beaches at Kennack Sands. Sleeping six in four bedrooms, guests will enjoy the benefits of modern design mixed with character features such as a flagstone ground floor and wooden drop-latch doors throughout. Entered into the ground floor hallway with cloakroom off, leading through to the lounge, kitchen and dining area. The lounge has comfortable seating for six people, wood burning stove (which fires the central heating), coffee table, flat screen LCD TV with BT vision and DVD player. The Dining area has table and chairs for six people and a Welsh dresser, double doors lead to the back patio area. The Kitchen is fully equipped with electric oven and ceramic hob with extractor over, microwave, fridge/freezer, washing machine and a dishwasher. Upstairs is all oak floored and comprises: Bedroom One (en suite), with 6' 'super king' bed with bedside shelves and lamps, built-in wardrobe, coffee table and seating area. Double doors lead onto a 'Juliet' balcony with sea glimpses. The en suite shower room is spacious and has a shower cubicle, heated towel rail, matching toilet, bidet and handbasin with shaver point and mirror. Bedroom Two has a 5' king-size bed with bedside tables and lamps, with a built-in wardrobe. Bedroom three is a single room with 3' bed, bedside table, chest of drawers, built-in wardrobe and contemporary vanity unit with sink. Bedroom four is also a single room with 3' bed, bedside shelf and lamp, chest of drawers and a built-in wardrobe. The family bathroom has a tiled floor, heated towel rail, shaver point, free-standing roll-top bath with matching handbasin and toilet. Outside at the rear is a gravelled patio area with some decking and a picnic bench, catching the sun for most of the afternoon. Parking to the front of the property for one car on the drive and one in the integral garage. The central heating is fired from the log burner in the lounge. Additional warmth is provided by electric underfloor heating downstairs and the heated towel radiators upstairs. There is disabled access into the property for visiting guests. Rental includes bedlinen, electricity, wireless internet connection, first supply of logs/coal (more available from Kynance Garage approx. 2 miles away). Regret no smoking and no pets.